The U.S. flag is subject to a detailed code of etiquette. 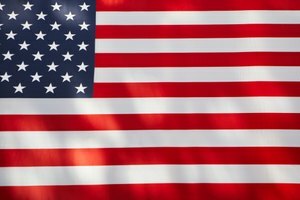 In 1942, the federal government established the first federal Flag Code detailing how to properly display and use the U.S. flag. The code does not establish criminal penalties for failure to comply; it's intended as a guide for civilians who want to show proper respect for the flag when they're flying it. The code explains how to fly a flag near your door. The union, or the blue section of the flag, should always be placed to the left of observers or visitors. This means your flag should be positioned to the left side of your front door, not the right. You may display the flag from a staff hung at an angle or horizontally from the front of the home, and the union should always be placed at the top or end of the staff unless the flag is flying at half staff. If you do fly your flag at half staff to honor a holiday or presidential decree, the flag should be raised to the peak of the staff for just a moment before being lowered to half staff. 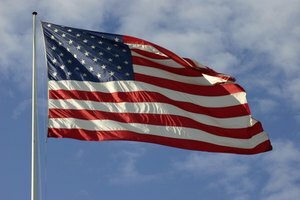 Traditionally, the flag was meant to be displayed from sunrise to sunset, then lowered during the night. 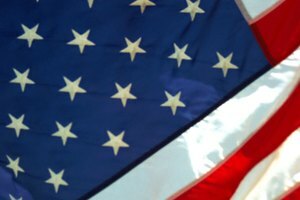 If you prefer to fly Old Glory around the clock, it's acceptable to keep the flag displayed day and night as long as you light the flag at night. For example, a small spotlight or floodlight placed by your front door and angled toward the flag could provide the proper level of light. 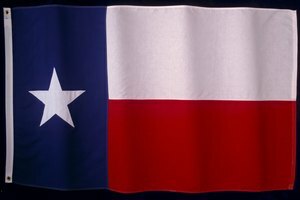 Remove your flag from beside your door and bring it inside during inclement weather, such as a rainstorm or snowstorm. 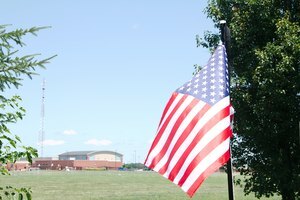 If you have an all-weather flag designed to withstand these elements, it is acceptable to leave the flag outside regardless of weather as long as the flag stays in good condition. If the flag develops rips, tears or wear, it must be respectfully retired according to rules found in the code. The Flag Code includes special rules for people who live in apartment buildings with a lobby or who wish to display the flag by the door in a commercial building, such as a workplace. If the building has only one main entrance, hang the flag vertically so the union is to the observer's left when he enters the building. If the building has more than one main entrance and the entrances face east and west, hang the flag vertically in the center of the lobby so the union is positioned toward the north. For buildings with multiple main entrances facing north and south, the union should face east. Beach, Emily. "The Proper Placement of the American Flag by a Door." Synonym, https://classroom.synonym.com/the-proper-placement-of-the-american-flag-by-a-door-12087460.html. 29 September 2017.